I grew up in a pretty modern Chinese family, whereby we followed certain Chinese traditions carried down through the ages more so because it was traditional rather than due to superstitious beliefs (or at least that is how I live my life now). One way or another, our traditions usually revolve around food and the symbols they represent in life. Take for example mandarin oranges, which are exchanged and eaten in abundance during the Chinese New Year season due to the similarity of the play-of-words where mandarin oranges sound like the word “gold” in Chinese. I would like to share with you a little tradition we follow in welcoming a new birth in the family. According to Chinese customs, when a newborn enters this world and celebrates his or her first full month, the family usually throws a Full Moon party where relatives and close friends come together to welcome the little bundle of joy. This usually also marks the end of the new mother’s confinement period as well. Treats such as Ang Ku Kueh and Chinese Red Eggs are consumed and exchanged during this celebration. In this post, I will be focussing on the making of the red eggs (as I recently made around 30 for cousins J&J’s baby’s full moon party). 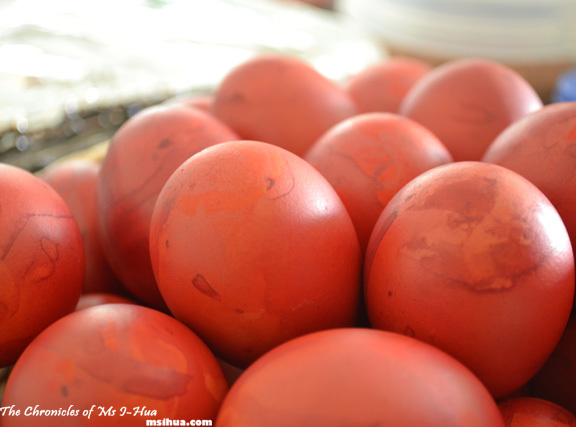 The eggs are dyed red to symbolise luck, good fortune and blessings (us Chinese really like the colour red). Eggs are used because they represent fertility and its shape symbolises peace and harmony. So armed with this knowledge and growing up eating many of these whenever a new baby popped out (relatives and friends), I volunteered to make these for baby J&J junior. When giving out these eggs, remember, it is even numbers for girls and odd numbers for boys. Place all eggs in a huge pot with the cold water and simmer on low heat over the stove (cook top) for 45-60 minutes. Place a teaspoon of the vinegar and salt in the water as the water is simmering. This will allow the egg shells to be more porous and susceptible to the red dye. Once the eggs are cooked, remove from heat. In a large bowl put a couple of tablespoons of the red dye and using gloves, start colouring the eggs, setting them aside to dry (on a wire rack or another bowl). You could use a paint brush to paint the shells red, but I couldn’t find one and ended up using my glove-covered-fingers to “paint” the egg shells (hence the artsy tie-dye effect on the eggs). Once the eggs are completely cooled and dried, you can place them into a basket/container or start handing them out to guests as they enjoy their meal at the full moon party. Note: The low heat prevents the eggs from cracking. So tell me my friends, what traditions do you follow to welcome a new born baby into this world? Oooh! Have fun and fingers crossed! I love hearing about cultural traditions, and how they’ve adapted in modern society. These eggs are lovely, and the tye-dye effect its very funky indeed! I love spreading knowledge or finding out more about traditions and cultures too! ooh i didn’t know ang ku kueh is used for the full moon event. 🙂 Now, i’ve learnt something! What a lovely tradition and I love the vibrant colour of the eggs. Always learning new things through food blogs:) The eggs look nice, how they’re not evenly red all over, but bits of dark and light red mixed in. Why do you need to cook the eggs for so long? Is it to make the shell take in the dye well? I love learning new recipes. This things looks wonderful. Can’t wait to try them at home. I love cooking and habituated to try something new ..Actually its my passion.. I have never try this Chinese Red Eggs..But now from this blog I will definitely try this.. Thank you for this sharing..
Full Moon Seafood House is also my favorite..
Those old traditions are good to keep. It seems so as I get older…. 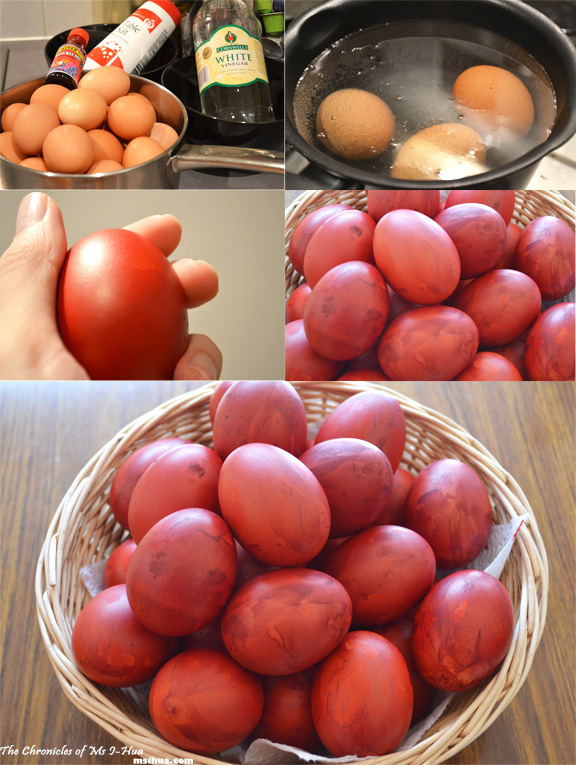 Love the artsy tie-dye effect on your red eggs. It really was by fluke! I just googled it and its so vibrant looking! Thanks for sharing that with me!!! Nice to see the slight differences in the celebration 🙂 100 days! That’s long man. I would only wait for a month as I would want to eat!! I never really had the opportunity to try it out… I guess now I have the time.. Lets see what are my outcomes from this dish. I liked the dish… I tried it once in my home… I was satisfied with the outcome I have got.